Before I started walking across Spain from Irún to Fisterra along the Camino de Santiago, I figured I would have to walk a marathon (26.2 miles or 42.2 kilometers) each day to finish in just under three weeks. As it turned out, I ended up averaging more: about 30 miles, or 48 kilometers, a day. The extra mileage is mostly from getting off-course due to directional discombobulation, taking detours (e.g., in search of hotels or even because of official signage), and exploring towns. My daily mileage was definitely farther than what most peregrinos typically do, but it honestly did not feel very difficult. It was certainly easier than, say, putting in 18-21 hours days on a bike as in the Trans Am Bike Race. The aerobic intensity was very low as I was usually walking casually and no faster than anyone else on the trails. My pace typically was 22 minutes/mile, or 2.7 miles/hour, or 4.4 km/hour. Regarding problems or injuries, I have nothing major to speak of. The main adverse effects included extreme tanning of my neck despite using SPF 50 sunscreen (after Day 5 or so, I got wise and wore a collared shirt to cover it), a loss of 6-8 pounds of body weight, and a significant loss of running fitness. I wore minimalist, lightweight shoes (Lems Primal 2) and for the first 19 days my pack weighed 13 lbs. (6 kg) excluding food and water (so usually about 15-17 lbs. total). You really do not need to carry any more than this; if I were to do it again, I would have brought about 4 lbs. less by leaving my Surface Pro computer and down sleeping bag at home. 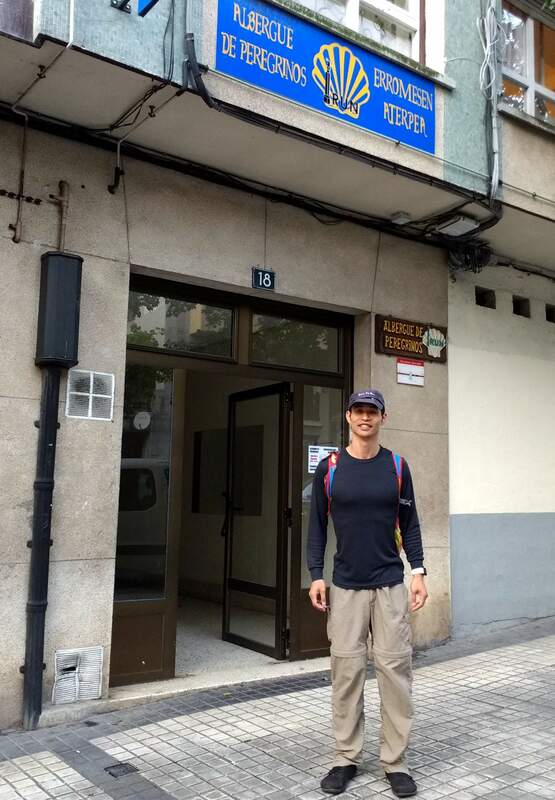 In fact, during the last two days, I stored a bunch of stuff at the post office near the Catedral de Santiago de Compostela to hike to Fisterra carrying less than 4-5 lbs. (2 kg). Below are sections summarizing my daily mileage. The first section is in miles; the second is in kilometers. You can see more data, including Strava maps and hours walked, for each day by clicking on the links in the first column of either table. The mileage seems very high. How much climbing does that typically entail? Reading accounts of 19th century army marches, I do seem to recall that many would cover similar mileage with lousy food and worn out shoes. Now most Americans don’t want to walk even a mile. Hi Jay, thanks for leaving your comment. Looking at the Strava data that I embedded within the blog posts about the specific days, it seems like I was doing 4-6000 feet of climbing per day many days, particularly on the Del Norte and Primitivo. It honestly felt easier than I expected. Would love to do another Camino again.